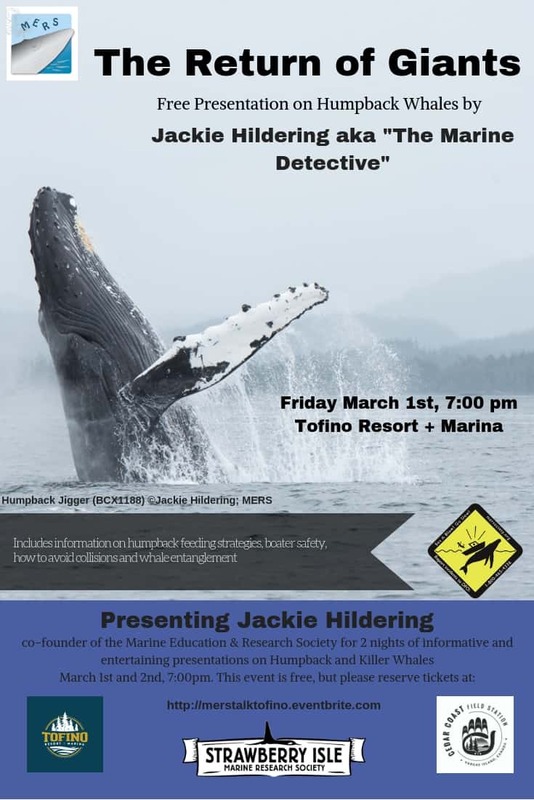 Please join us for two free lectures by Jackie Hildering (aka The Marine Detective) from the Marine Education & Research Society on March 1st and 2nd! In addition to sharing MERS’ research on Humpback feeding strategies and rate of entanglement, Jackie will discuss how the fortunate return of these giants from the brink of extinction necessitates increased boater awareness about avoiding collision and what to do if entanglement is witnessed. Their research includes having documented a novel feeding behaviour of Humpbacks dubbed “trap-feeding”. These two lectures are sure to be educational, informative, inspiring, and thought provoking. Join SIMRS, Cedar Coast Field Station and Tofino Resort + Marina for two FREE nights celebrating two of our most iconic marine mammals in Clayoquot Sound. Please reserve tickets here, as we expect this event to be popular.